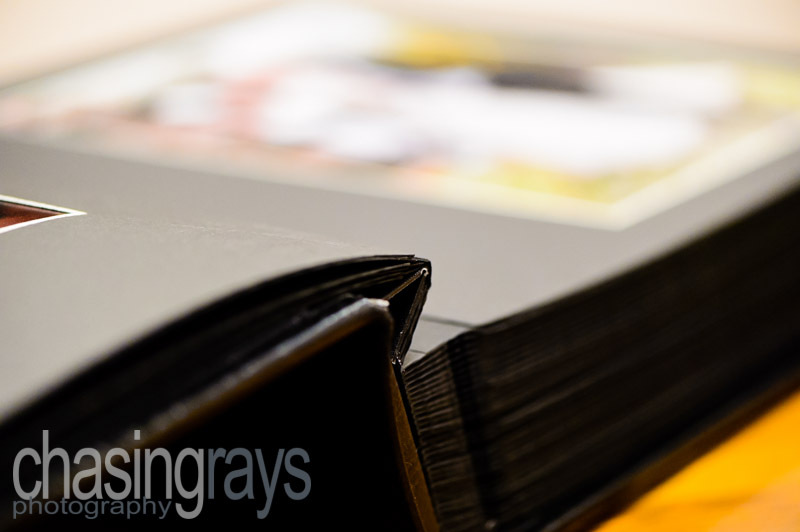 Home > Chasing Rays Blog > Why Choose A Professional Photo Album? Why Choose A Professional Photo Album? One issue that frequently comes up, especially nowadays with digital cameras being mainstream devices, is why should you want to choose a professionally constructed album of your special day instead of a disk of images? "One issue that frequently comes up is why should you want to choose a professionally constructed album of your special day instead of a disk of images….."
My main point would be one of your memories. In my experience, a disk full of images tends to be looked at once or twice, then gets relegated to a draw and forgotten about. But consider… once it’s over, what do you really have left of your special day? You might have your wedding dress or suite, and certainly the keepsakes and gifts you might have received. But your strongest visual records – those true reminders of the day’s events – are your images. Now, if they’re sat in some draw forgotten, you’ve effectively lost those memories… much better you have something tangible to pick up whenever you want, to show whomever you want, just how fabulous your day was. I can’t personally think of a better way to do this than with a professional album. The second point is one of quality. Yes, you can take a disk of images and get them printed at low cost, but are they a proper reflection of your day? And how long will they last until they fade, even if you keep them behind glass? Ultimately, you get what you pay for with this kind of low cost printing, so if you do want images that you can be proud of for many years to come, you are better asking for high quality prints from your photographer. Your photographs can either outsource to a professional lab or, as I do, print them themselves on a high-end inkjet device. You can leave it there if you want, but then to show your images off to their true potential and, again, to preserve your memories, I really can’t recommend either an album, or the various types of professional frame, enough. Your photographer will be more than happy to help you with these choices. True, the initial costs can be a few hundred pounds, but ultimately the long-term investment you make at this stage will more than equal such an outlay through a set of beautiful, timeless keepsakes that will be there for the enjoyment of yourselves and the future generations of your family. Whatever you decide, there’s nothing that gives me greater pleasure as a photographer than being the person who provides you with these special memories.